Harry Potter and I share a birthday. Perhaps because of this I feel that he and I, fictional character though he may be, have a special bond. 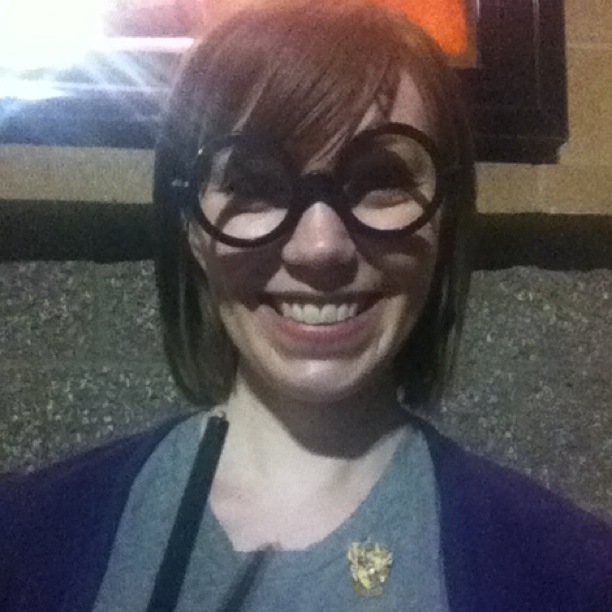 So, with the release of the final movie installment of the Harry Potter saga, I decided I had to attend the midnight premier. I’m not going to talk about the movie, other than to say that somewhere between five and ten Kleenex were used by me alone, and that – finally – they got it right. This last weekend, with a little too much time alone on my hands, I spent a lot of time thinking about this ten-year journey. I started reading Harry Potter in college; J. K. Rowling had already written four books before I read the first one. But I was immediately hooked. I reread the first book this last weekend, and I was reminded of all the things that made me love the books in the first place. First there was this lonely, orphaned little boy, who escaped his unhappy life with his guardians; he was kind and brave and easy to love. There was Hagrid and Ron and the Weasley twins. And then I met Hermione, who was rather like a braver version of my eagerly overachieving, rule-abiding, tightly wound self, and as I think we all delight in characters to which we personally relate, so I did in Hermione. It’s nearly impossible to single out characters from this series, though, without instantly thinking of others you should have included, like the strict but fiercely loyal Professor McGonagall, the patient and kind Dumbledore, and Dobby and Kreacher! But as much as I love Harry and Ron and Hermione, my favorite character of all just might be Severus Snape. Maybe I’m just a sucker for tales of tortured souls and stories of unrequited love, but to me, he’s the unsung, tragic hero, who loved deeply and lost much; whose sacrifices, because not obvious, would never be celebrated as other characters’ were. Beyond the characters, it was the minutiae of the wizarding world – the many little details and the care taken in their creation; things like butterbeer, the entire village of Hogsmeade, Mrs. Weasley’s charmed dish-scrubber, the tents (and handbags, for that matter) that were bigger on the inside, Hermione’s Society for the Promotion of Elfish Welfare. All of the thought and feeling behind the action of the story – these are the precise things that you don’t get from the movies and which together conspire to make the true magic of the Harry Potter stories. So, happy almost-birthday, Harry Potter, and thanks for the many magical late nights when I stayed up reading far later than I should have done. This entry was posted in Books, Reviews, and Reading and tagged birthdays, books, Harry Potter on July 18, 2011 by ms.grammarian. I LOVE this. I am so with you on Snape–there’s something so honorable about his character. I also re-read the first book this past weekend, weird. So many great things about this series. J.K. Rowling achieved something that most authors aspire to, but many never succeed-that is the creation of a new world, where I have just enough details to give it shape and reality in my mind, but not so many as to make it appear cheezy and unreal to my imagination. Or something like that. I didn’t sleep for about a week when I first read them-once I started reading the first book I couldn’t put them down, and I finished the whole series. Such a great series.